Plate "xv del Codice internazionale dei segnali" no vowels or numerics; "X" "Y" "Z" absent. "International Code Flags" p559. Changes include	"F" and "L"
"Alphabetical and Numeral Flags Used in Naval Signalling", Plate 9. "Special Flags Used in Naval Signalling", Plate 10. "Numbered & Special Pendants Used in Naval Signalling", Plate 11. "Flags and Pendants Used in the International Code", facing p58. Changes include "C" "D" "E" "F" and "G"
"Numeral Pendants" "Substitutes" "Code and Answering Pendant", facing page 58. 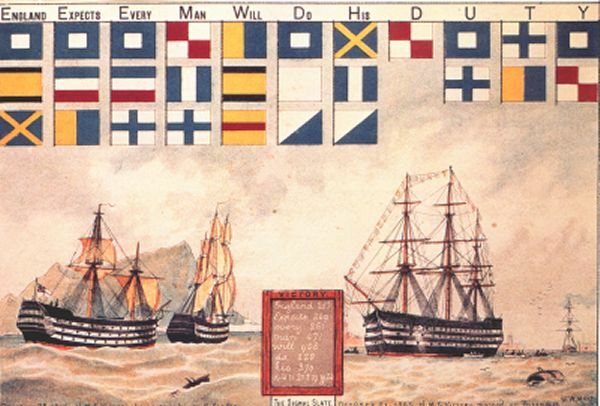 "Other Flags and Pennants Used in Naval Signalling", plate 3. All Naval numeral flags have changed. "Special Navy Flags and Pennants", p. 384. Changes include "church" flag, and addition of "fourth sub" flag. Nelson's message via flag signal - "England Expects Every Man Will Do His D U T Y" - The Boy's Own Paper, 1885. Please see some NOTES on this subject.